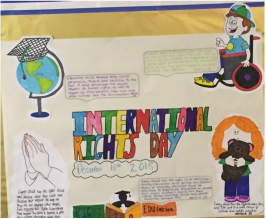 Since moving to our new accommodation in January, we have been busy discussing ways in which we can display the different resources and activities and information that we have about our Rights Respecting journey. During March and April we will be busy updating our classroom displays to show off the school charter and ensure that everyone within the school knows what it is and why it is important for us. The United Nations Convention on the Rights of the Child, or UNCRC, is the basis of all of Unicef's work. 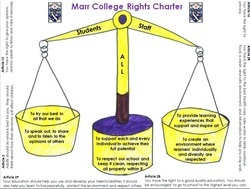 Working with our pupils, we have developed our Rights Respecting schools charter for Marr College. All pupils were involved in discussion regarding the rights that we would like to prioritise for our school. Each month our pupil group works to develop and create resources and displays for all of our monthly lessons in Tutor Time.